Do you love to travel by car? We do! 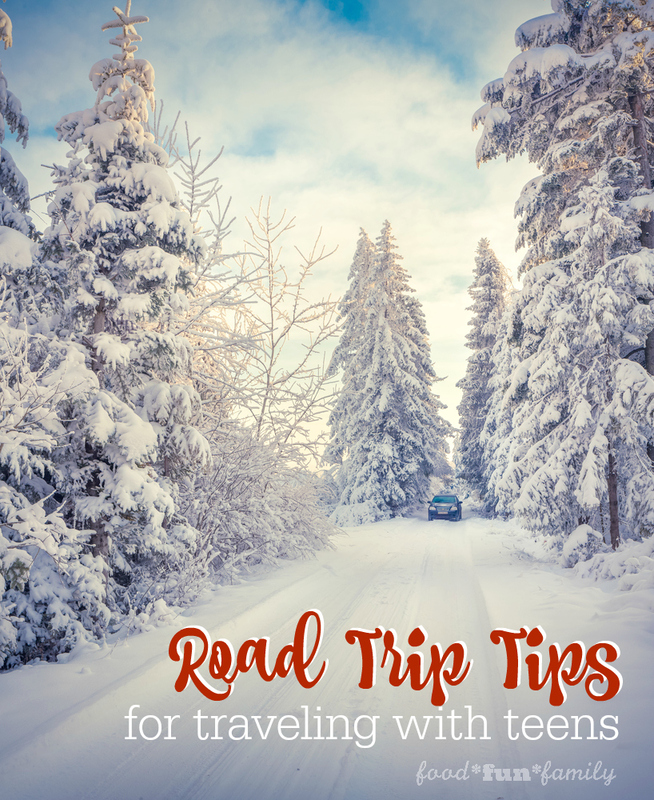 Be sure to scroll down to read my best road trip tips for traveling with teens. Unless you live down the street from your entire extended family, then most likely the holidays include some sort of travel plans – either you’re traveling to see family or family is traveling to see you. If those travel plans include extended time in the car, then chances are you need some tips for traveling by car with kids (or if you’re like me, then tips for traveling with teens. Eek!). Autotrader provided the Happy Kids, Happy Ride Kit giveaway below, and the winner will be chosen at random by me. All thoughts are my own. Are you heading on a road trip with your family this holiday season? We love taking family road trips, and I’ve been very fortunate that my kids have almost always been very good travelers. But hours upon end in a car is tough for anyone – even the most seasoned traveler. Even I need a few reminders every once in a while. Autotrader, the leading authority in car buying, has put together an amazing list of #MomHacks for driving in the car with kids. I love their idea of putting colored pencils and paper inside old DVD cases for coloring in the car. Now, that’s portable entertainment! Also worth reading is this article by Autotrader about holiday road trips. Getting ready for a road trip with your family? I think my favorite tip of all is #1…Which tip resonates with you? © 2015 – 2016, Food Fun Family. All rights reserved. Last entries. Thanks so much for the contest. My tip is to bring a basket of food and drinks for the kids, and a basket of toys and coloring books! Games like i-spy are fun as well. My kids have toys that they can only play with in the car. It’s the only way they’re able to sit in the car quietly. My first tip is to have a few power bank chargers on hand. You may not always have access to an outlet to charger your devices so a portable power bank is nice to have, especially if your phone is about to die. My second tip is a package of scented trash bags so you can keep your car clean and easily throw out all garbage at a rest stop. We like to have good music, tons of snacks and juices and a mobile device to watch a movie or play games such as a tablet to make our road trips fun! We stop often at rest stops so the children can get out and stretch their legs. My tip would be to have snacks and games ready for the kids because they get bored easily on road trips! I hate to say it, but electronics are probably the best ‘teen-sitters’ available, so make certain they have them for the trip! My only tip is to have lots of entertainment. If they have something to do it keeps them from asking so many questions and makes the time go by quicker. Thank you! Allow extra time for frequent stops and who knows when you may find an interesting side trip. When traveling, use a plastic cereal container with a lid for all of the garbage in the car. This works great for all of the snacks, napkins, etc. My best road trip tip is to make sure to take plenty of stops along the way. Just getting out of the car for a little while makes the trip so much nicer. My tips is to plan some fun stops along the way! Pack well: snacks, GPS, plans – know where everything is and designate a person as leader over finding anything needed. Oh, and lots of water. my tip is to stop at a park and run around for a while to let out our energy. My mom hack is having a bag of snacks in the glove compartment for when they start getting whiney and we can’t stop. Bring snacks and activities for the kids. My tipi is to have individually packed snacks. snacks, coloring books, crayon, books, favorite toys, portable dvd player and babywipes a must.. Sing, play games, and take snacks that don’t leave crumbs – no one wants to clean the car during a road trip! I like to drive during the night while the kids are more likely to sleep, when possible. Taking enough stretch/potty breaks is a very good thing. You can plan ahead for some stops that have interesting things. The two weeks before our junior year in college my roommate and I traveled up and down the state of California visiting friends and family. No plans, no notice to anyone, we’d just show up. We were kind of idiots, but it sure was fun! I always have to have pillows & blankets when I travel. Having 5 kids I have learned to bring activities or movies to keep them busy and plenty of snacks and drinks. Let everyone have a say on where you’re going and what stops you might make. it seems like everything is covered, so my tip is to be patient and don’t argue! Be prepared by using checklists. Bring lots of fun activities for your kids to do to keep them happy, Also, pack your own snacks. It’s healthier and saves you lots of money. My tip is to pack snacks and bottles of water. Having to buy water at stop along the way is very expensive. My best road trips have just been driving to go and visit my bother or my grandson. Not way too long of trips is the best. If at all possible take a friend or other family member that you know travels well (no car sickness) Kids get board and a friend helps. Keep a pillow for them its hard to sleep with your neck all twisted they can lean on it. Snacks anything not sticky that can be easily swept up and out. For someone who always had car sick kids be sure to bring buckets, towels and wet washrags – you never know what mess you’re going to have to clean up. My best tip is to be sure to schedule time for unexpected stops, because you never know what wonderful place you may spot along the way. We like to have thigns ready by packing snacks, water, change of clothes, and our first aid kit. I never know what I might need with the kids in the car. We even have shoes! I can;t even begin to tell you how many times we have left home without shoes! Patience. Those road trips can be very long. I have a tote bag in the car with everything we might need. Plastic utensils, plastic cups, a roll of paper towels and a sample size towelettes. We don’t always like to go out to eat but sometimes we get thirsty or want a snack. We pick something up at Target and it doesn’t have to be the small 1 serving drink, we’ll get the big one and share. I make sure everyone has everything they need to make themselves comfortable. Lots of toys, magazines, and food/drinks. I make sure I have snacks for everybody. We get cranky if we’re hungry! My best tip is to wear comfortable clothes! No one wants to be stuck in the car for a long period of time while uncomfortable. We love travel Bingo on road trips! I like their ranch veggie dip. My best tip is to pack plenty of snacks and drinks and lots of activities/books for the kids to do while in the car! Make sure you have a gps, and a spare tire with lots of gas. Make sure you have a GPS. My tip is to bring plenty of snacks, games, and movies. My my tip for car trips is play the eye spy game! It keeps everyone engaged on trip, you’ll see things you wouldn’t otherwise see and if your kid is car sick it helps because they focus outside the car rather than the motion of the car! pack lots of snacks & patience! Take plenty of non-messy snacks with you and make regular stops for bathroom breaks. My best road trip tip is to make sure you have lots of good music to keep you going. Couldn’t go on a road trip without our iPads. Our best road trip was last winter when we were told a city near us had snow so we drove the family up to spend the day in snow. My best road trip tip is to bring plenty of books, snacks, and water. take a cooler for drinks, and healthy snacks, so you wont have to stop for junk food. make sure everyone has enough room and their own space. take an emergency kit, make sure the spare tire is good, have a cell phone charger or battery pack. Our best road trip was a trip that we took from NJ to SC. We took our time with the trip and made a number of stops. It was fun and relaxing. I don’t road trip much but I do know to pack lots of drinks and snacks. Bring some fresh fruit along. I bring a CD with Nursery Rhymes on it. It make the time go by fast and it is fun. Extra snacks, batteries, charging cable, pillow and a roll of “just in case” toilet paper and we’re good. We took my son and his friend on a 10 day road trip on California 1; it was awesome! Always pack snacks and games for road trips. My tip is to plan for messes because there WILL be messes. My best road trip tip is to use a grocery bag as a trash bag! That will help keep down the clutter and trash while on a road trip when every one is eating snacks, etc. Travel with plenty of items (snacks and toys) to occupy the family for a long period of time. We like to bring the iPad! Card games, coloring books for younger kids. Older kids and read fun books, magazines, or help with travel guides. My tip is to bring a cooler with drinks and snacks. It’s also useful for items you buy on the trip. Add 2 hours cushion on your travel time. Even if you already plan a stop or plan to drive for certain hours, sometimes unexpected things can happen. My best road trip tip is make sure your AAA membership is current. My tip is electronics are teens best friend and don’t forget the chargers/batteries. Bring plenty of snacks and drinks. My best road tip is to make sure to have plenty of games and healthy snacks for the kids when traveling so no one gets bored! I just make sure there are games or things to occupy the kids, and have water, juice and snacks at the ready.